Vincent Van Gogh (Dutch, 1853 – 1890) Pietà (c. 1880) Oil on canvas. 73 x 60 cm. Vatican Museums, Vatican City. We do not usually associate the two; but, there it is: a Van Gogh hanging somewhere between one of the world’s largest collections of antiquities and the Sistine Chapel. More than four million people visited the Vatican Museums last year. I was was one of them. For those who have not made their own pilgrimage, it is difficult to describe the vast, Byzantine compound that holds the Catholic Church’s collections. With objects as diverse as Egyptian artefacts and Sevres porcelains, the “museum” is divided into several exhibitions, conjoined with palaces that make up the Pope’s apartments. Together, they are nearly impossible to see it all in a single day or, even, week. And, if you are like me, mentally exhaustion sets in after an hour. So, it is understandable that most tourists make their way directly to the brightest stars in the collection (e.g. Raphael’s frescoes, Laocoön), without seeing what in other museums would be show stoppers. The Vatican has a sizable collection of modern and contemporary religious art. These works range from mid-nineteenth-century artists to today and are hung in a series of dimly-lit, basement rooms leading to the Pope’s apartments. Visitors are given the choice of a short cut directly to the Sistine Chapel or a fifteen-minute walk through the rooms where the Modern Collection hangs, sometimes unlabeled. Most choose the direct route. Even those who take the long way end up rushing past works by Auguste Rodin, Pablo Picasso, Salvador Dalí, Giacomo Balla, Otto Dix and many, many others. 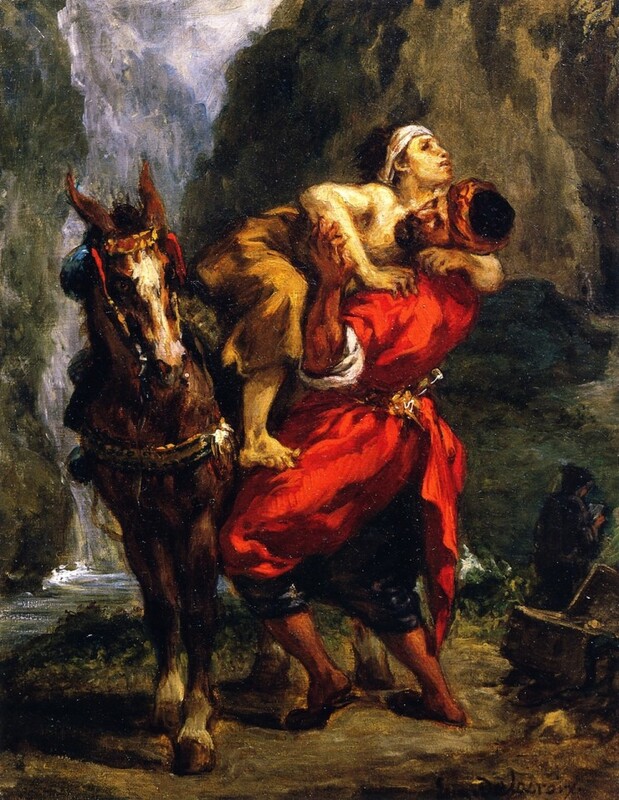 Eugène Delacroix (French, 1798-1863) The Good Samaritan (c. 1848) Oil on canvas. Private Collection. 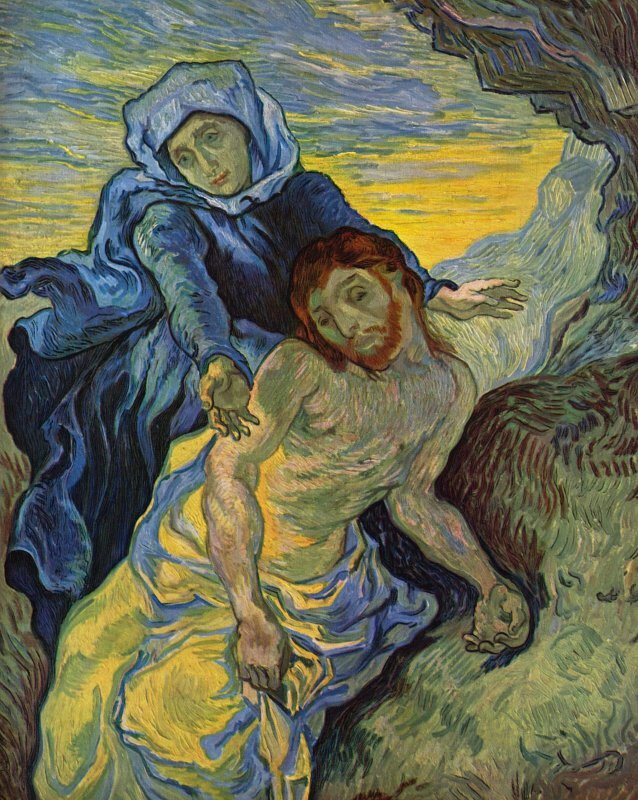 Some scholars believe that Van Gogh’s Pietà, showing the dead, tortured body of Christ after the Crucifixion, is actually a self-portrait. (Note the red beard.) While in the Hospital of Saint-Rémy, housed in an old monastery,Van Gogh wrote his brother Theo: “I am not indifferent, and pious thoughts often console me in my suffering.” In any case, religious works by Van Gogh are rare. 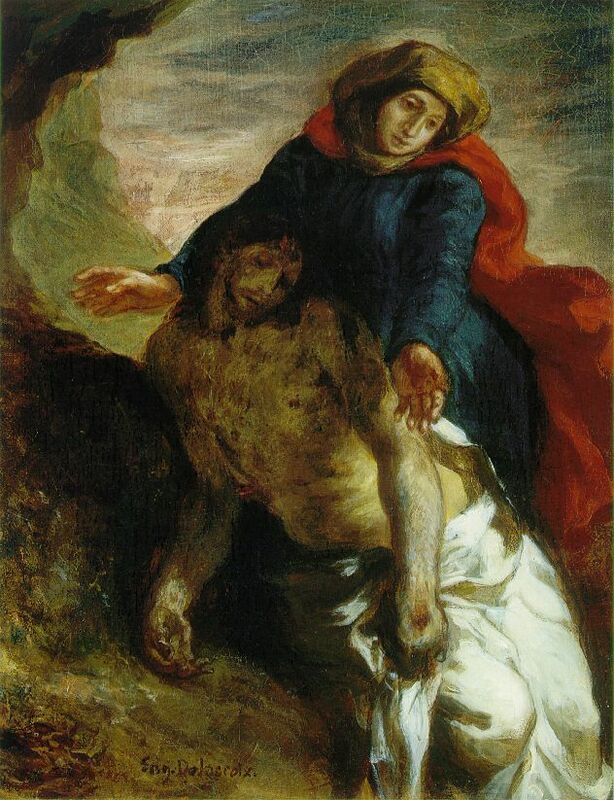 The Pietà is one of two biblical paintings he copied from Delacroix. 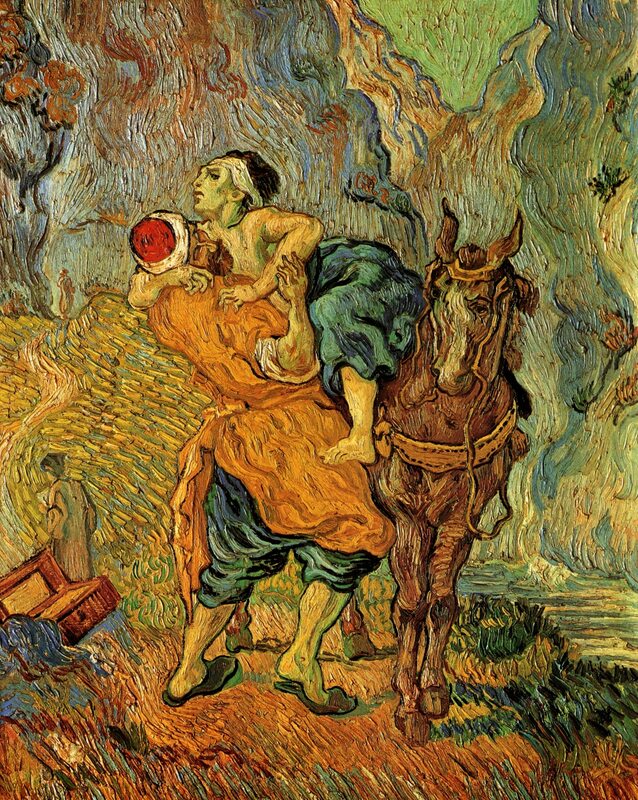 Vincent Van Gogh (1853-1890) The Good Samaritan, after Delacroix. Oil on canvas. Van Gogh hugely admired Delacroix, mentioning him more than 95 times in personal letters. In particular, he admired Delacroix’s use of bold and vibrant color. We do not know if he was referring the painting in the Vatican or the other version, hanging in Van Gogh Museum, which some believe to be made late. The Vatican Museum of Modern Art did not purchase its painting. Like many other works, Pietà was a gift from a member of the Church, who donated it his diocese in New York sometime mid-century. Of the two versions, the Vatican’s is much smaller. It is also darker, which is, perhaps, more a result of not being as well cleaned. But, the darker hues, combined with the dim lighting, in my opinion, imbue the work with greater pathos. Eugène Delacroix (French, 1798-1863) Pietà (c. 1850) Oil on canvas. Nasjonalgalleriet, Oslo. There might be something wrong with your RSS. You should have a web developer have a look at the site. I was in rome ten years ago, and did vist the Vatican.I wish i paid more atention. I mised it,my lost.I love van gogh. Beautiful! It is awe-inspiring to go see an exhibition like this. Last smeumr, I went to see the Monet exhibit with my parents..it was absolutely wonderful. Amazing to see the different “periods” a famed artist goes through as they travel throug life. I visited the Vatican this morning and this was, by far, my favourite piece. I’m no Van Gogh expert but, like you, something about this piece touched me. The fact it is hung in a side room with little to no visitors made it all the more special. The painting “pieta” (about 1850) – Is this the one you refer to as the one of Christ?? If not this one, then which painting are you referring to?? Thank you. I am referring to one painted by Delacroix that is reproduced in the post.